What Do We Know About the Top Ten Challenged Books of 2016? It’s that time of year again: This week, the American Library Association released its list of the top ten most challenged books for 2016. CBLDF has joined in the defense of several titles on the list, so today we’re taking a look back through our coverage of these cases! Since winning the Caldecott Honor in 2014, Jillian and Mariko Tamaki’s This One Summer has become one of the graphic novels that CBLDF has had to defend most frequently. In 2016, the book was removed from a K-12 library in Henning, Minnesota. CBLDF found out about the removal after the fact, and we led a coalition in defending the book, which was restored, albeit with the unsatisfactory decision that it could only be accessed by students in grades 10-12 and only if they have parental permission. 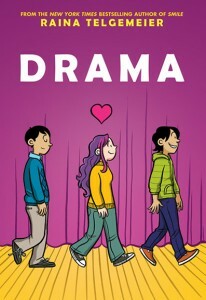 Raina Telgemeier’s Drama is “enjoying” its second year on ALA’s top ten list. The highly acclaimed bestselling book is most likely on ALA’s list because it was removed from a Texas junior high school for being “politically, racially, or socially offensive.” We learned of the removal via the Texas ACLU’s annual report on challenges and bans in the state. Notably, the ban that landed Drama on the list previously also happened in Texas. Aside from the three graphic novels, CBLDF also joined in several coalition efforts to defend other books on the list in 2016. We routinely sign on to such actions not only out of principle, but also to protect the freedom to read comics. Censorship manifests in many ways, and the unique visual nature of comics makes them more prone to censorship than other types of books. Taking an active stand against all instances of censorship curbs precedent that could adversely affect the rights upon which comics readers depend. John Green’s Looking for Alaska made its fourth appearance on the top ten list since 2012. In April 2016, the author himself rallied fans to support a high school teacher in Marion County, Kentuck,y who was being publicly attacked for using the book in a 12th grade English class. CBLDF and other members of NCAC’s Kids’ Right to Read Project sent the district a letter defending the book, and ultimately a review committee voted to retain it in the curriculum. Alex Gino’s novel George, about a transgender middle schooler, entered our coverage in a roundabout fashion in June 2016 when author Phil Bildner was abruptly disinvited from speaking to students in Texas’ Round Rock Independent School District. Bildner suspected that his talks were cancelled because he had recommended George to students during his visit the previous year; a later statement from the school district did not contradict that theory. Rainbow Rowell’s Eleanor and Park was one of three books targeted by a small group of parents in Chesterfield County, Virginia, also starting in June 2016. The books were originally included on district-wide lists of titles recommended (but not required) for summer reading, which were compiled by librarians and shared with parents and students before the end of the school year. After initial complaints about books that some parents found inappropriate, Chesterfield County Public Schools replaced the local lists with links to third-party sites including YALSA, Scholastic, and Read Kiddo Read. At that time State Sen. Amanda Chase, also a district parent, entered the fray by claiming that because some of the critically praised books from the original lists also appear on the third-party sites, “it’s the same thing” as the district recommending those titles directly. Chase also suggested the librarians who compiled the district lists should be fired for “not recommending books that line up with Chesterfield County Public Schools’ core values” and that the three books should “absolutely” be removed from school libraries altogether because “if it’s X-rated material, I don’t want my kids getting their hands on it.” After another letter from CBLDF and our KRRP partners, a review committee finally voted in September to retain all three books. Eleanor and Park also has already chalked up one point on its way to a spot on the 2017 list, after it was abruptly removed from the 8th grade curriculum in Yamhill, Oregon, by school board members who had only read excerpts — some of which later turned out to come not from the book itself, but from online fan fiction inspired by it. The board later reconsidered that vote and decided to follow its challenge policy, which requires that a review committee read the book before taking any action to remove it. CBLDF again joined with other KRRP members to send a letter in defense of Eleanor and Park, discovering in the process that even though the challenge was regarding classroom use at the middle school level, the book has also been pulled from the library at the district’s single high school. This case has not yet been resolved.